Disastrous flooding in South Florida is making the news again as water from Lake Okeechobee overflows and is released through the St. Lucie and Caloosahatchee estuaries. Unfortunately, this is something that we see all too often in the region—the water that should naturally flow south from Lake Okeechobee is trapped by man-made barriers and confined to canals after heavy rains. This massive influx of highly polluted freshwater is destroying coastal estuaries and endangering public health, Florida’s economy, and the Everglades. To the excitement of staff members at NPCA and many others, Florida Governor Rick Scott responded to this crisis last month by providing $90 million from the Florida Department of Transportation over the next three years to help fund restoration work on Tamiami Trail. Tamiami Trail has been one of the greatest obstacles to restoring the Everglades. The road acts like a dam, blocking critical north-south water flow. 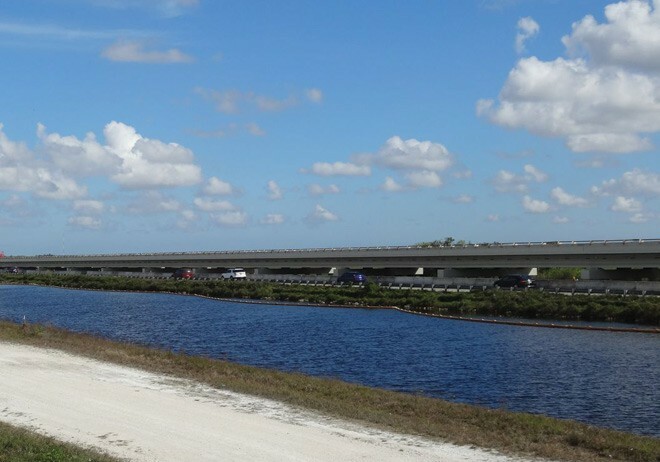 After 20 years, the first one-mile elevation of Tamiami Trail into a bridge was completed earlier this year, and now Governor Scott’s funding will make elevating an additional 2.6-miles of the road possible. This is the next vital step to letting water flow naturally through the Everglades—water upon which marine wildlife, fisheries, and bird nesting colonies depend. The first mile elevating Tamiami Trail was completed earlier this year. Photo © Dawn Shirreffs/NPCA. While bridging more of Tamiami Trail won’t help the estuaries immediately, it is part of a long-term solution that will provide much-needed relief to the entire Everglades ecosystem. Funding has been a major hurdle for the project, so Governor Scott’s historic commitment brings us much closer to having shovels in the ground to elevate the road and let water flow through the famed River of Grass. The next step is to ensure that Congress provides necessary matching funds for the project to meet the estimated $150 million to $180 million total cost. NPCA is committed to securing the necessary funds to see this project begin as soon as possible. Everglades was the first national park dedicated for its biological diversity as opposed to its scenic vistas. However, as each year passes, its biological integrity is increasingly jeopardized because of altered water flows. NPCA views the bridging of Tamiami Trail—a full 6.5 miles, as recommended by the National Park Service—as the highest priority for restoring an entire ecosystem in this national park.